Sometimes, you just don’t have the time or patience for fancy doo-dads…you just have to get in, get out, and get on with your life. To help you speed through life efficiently, Matthew McComb has recently released Simple2Do, a to-do list application that’s both simple and functional. Task management has never been so easy. There are two ways to add something on to your to-do list. You can quickly add a task by tapping the Compose button at the top left, and it will automatically be inserted into your Inbox, where you can edit all the other details later. Or, you can tap on the + button on the bottom left and add the task with all its details–due date, notes, etc.–if you’re not in a hurry. Don’t like typing in portrait? No problem, all the screens in Simple2Do can be oriented in the landscape position as well. One of the little, but powerful, details is the ability to create categories. You can do this while editing a task: just tap on the Category bar and choose Add A New Category…it’s that simple. You are free to move tasks between your categories as you see fit. Along with the Inbox, all categories will show up on the home screen with the number of tasks still to be done next to them. A nifty category to note is the one titled Now Due: all your tasks that are coming due will be routed to this category, so you can see at once which tasks need to be done first. Once one is done, just tap on the empty little check-box next to it, which will send it to the Completed category. All categories include an emailing option, usually found on the bottom right corner. Simple2Do felt like a seamless switch between in-house apps like Email and the app itself, both by design and function–this means that even upon first launch, using this app will be very intuitive and comfortable to use. It is a extremely simple app that isn’t dressed up, but that’s part of its charm and usefulness, as it is one powerful tool. The point is to get you on your way to finishing your task as quickly as possible, and Simple2Do has no problems in doing just that. This app is completely worth the $0.99 download, especially for those who like to make lists. 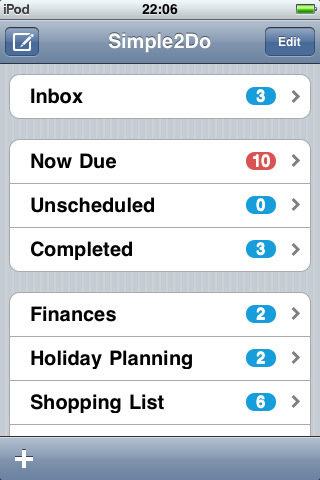 AppSafari review of Simple2Do was written by Julie Guan on May 26th, 2010 and categorized under App Store, Notes, Productivity. Page viewed 4040 times, 1 so far today. Need help on using these apps? Please read the Help Page.